The Sacramento Kings, fresh off trading their franchise center for Buddy Hield and a draft pick, have apparently realized that their GM is a dunderhead. That’s good news, as a man who publicly announces that he turned down better offers for his best player and doesn’t know how the salary cap works should not be running an NBA team. Vivek Ranadive’s Kings will not hesitate to abandon any plan that doesn’t work, or also any plan that does work, because they are run by morons. Sources told ESPN.com that Kings owner Vivek Ranadive sought and received permission directly from Sixers counterpart Josh Harris to speak with Hinkie. 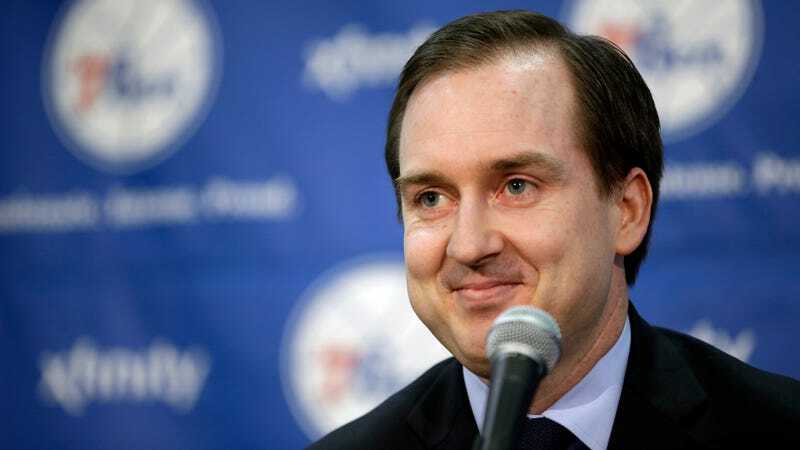 Sources say Hinkie has long intrigued Ranadive, whose franchise has been thrust into a rebuilding mode not unlike Philadelphia’s status under Hinkie in the wake of trading DeMarcus Cousins to New Orleans. It’s been a little less than a year since Hinkie dropped a 13-page technobabble letter of resignation, and this is the first time he’s publicly been connected to any job. The Kings are the perfect team for him to land with, since Ranadive is fluent in the same nonsensical Silicon Valley language as Hinkie, and has praised the virtues of contrarianism and trying bold new approaches to NBA basketball in the past, such as playing defense 4-on-5 or trading a franchise cornerstone for a bag of peanuts. Hiring a man whose philosophy during his last job can be summed up as “lose forever until you stop losing forever” would certainly be a contrarian hire for a team about to wrap up its first season in a new taxpayer funded arena. Hinkie’s existing connection to Sacramento, such that there is one, is a particularly stupid trade the Kings made with him in 2015 that will guarantee Philly gets at least one of Sacramento’s first-round picks. Since Hinkie appears to value draft picks over everything else, one wonders if the clock for the Kings to try and become competitive would shift back a few more years with Hinkie in charge. The Process lives on. Update, 9:57 p.m. EDT: Lovely. Geoff Petrie Lambastes Vivek Ranadivé&apos;s "Sophomoric Attempt At Revisionist History"